I somehow got it into my head that I wanted to start making homemade pizzas. I looked up a recipe on allrecipes.com and looked at the tips in the comments. Unfortunately, making perfect pizza at home is harder than it sounds. This pizza really should be called 5th Times the Charm pizza, seeing as it just keeps getting better and better every time I make it. However, it really was the third time that I actually felt successful. Professional pizza ovens are a brick oven that are heated to 900+ degrees Fahrenheit. Our ovens at home don't get this hot and are, obviously, not made of brick. So through trial and error and reading up online, this is how I learned how to make pizza at home. paper. It was also a bit doughy in the middle. I read in one of the comments a suggestion for making pizza without a pizza stone. Her brother had suggested preheating the oven with a baking sheet in the oven. Roll out the pizza dough on parchment paper, then put parchment paper and all into the oven on top of the preheated cookie sheet. What I didn't understand was that there is a HUGE difference between parchment paper and wax paper. Thinking they were the same thing, I used wax paper this time around. This turned out to be a horrible mistake! The pizza completely stuck to the wax paper and was almost inedible. The crust also didn't get super crispy, so the preheated cookie sheet really didn't work as well as a pizza stone. calzone. Picture taken after we had cut off two of the ends. The reason a pizza stone is recommended for homemade pizza, is because the pizza stone simulates a brick oven. The stone retains heat, which provides a really even heat distribution throughout the pizza. Without it, the pizza will tend to be doughy in the middle. The stone is also porous, which helps absorb moisture from baked goods. After reading up on why pizza stones are needed for the perfect homemade pizza, I decided to get one. The following week after the first attempt, I purchased a pizza stone from Macy's for $30. It also came with a decent pizza cutter, although the one we already have is a better cutter. Since I had read that the stone is supposed to absorb moisture from the dough, I decided to forgo the parchment paper. I put the pizza stone in a heated oven and preheated the stone for 15 minutes. I then rolled out my pizza on a cookie sheet dusted with corn meal. The corn meal was supposed to allow the pizza to slide off the cookie sheet. This was not the case! I don't know if my pizza dough was just too sticky or what, but that sucker was not going to come off of the cookie sheet. Especially since it was weighed down with toppings. The only way we could get it off the cookie sheet was to flip the pizza in half, creating a giant calzone. We then flipped the calzone onto the pizza stone. 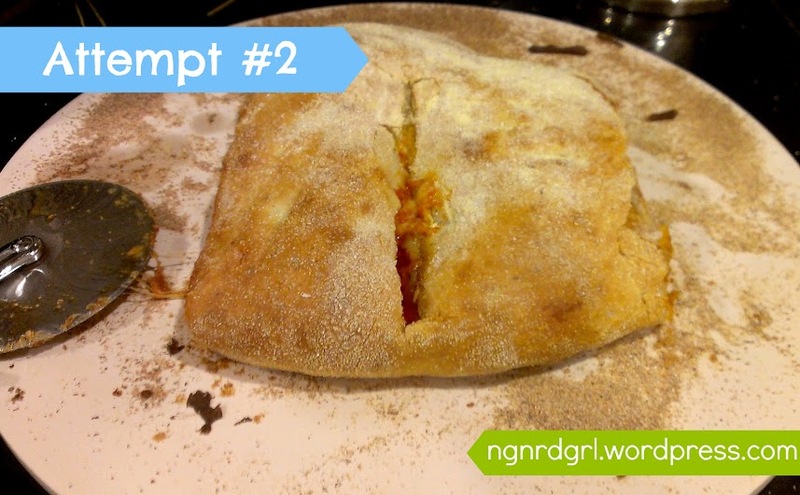 The pizza stone made this calzone come out nice and crispy, confirming that a pizza stone is definitely the way to cook pizzas at home. Although our calzone was super yummy, it still wasn't homemade pizza. Attempt #3 - Success!!! Finally! After having semi success with the pizza stone, I decided to try parchment paper. REAL parchment paper, not wax paper. The parchment paper states that it is good up to 420 farenheit, so I set the temperature to match this. After the oven was done preheating, I preheated the pizza stone for 15 minutes. I rolled out the dough on parchment paper lightly dusted with corn meal. I used a baking sheet to transfer the parchment paper with the pizza to the pizza stone. This turned out perfect!!! I was so happy that I had finally achieved real pizza at home. The crust turned out nice and crispy, allowing you to single hand a slice of pizza. Using the full amount of dough from my recipe resulted in a thick crust. 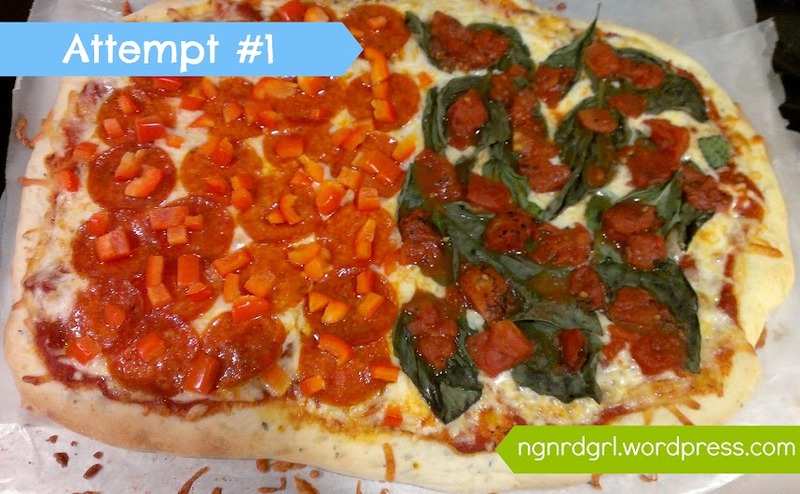 For a thinner crust, you can split the dough in half. This is great for feeding more people or freezing a pizza for later. 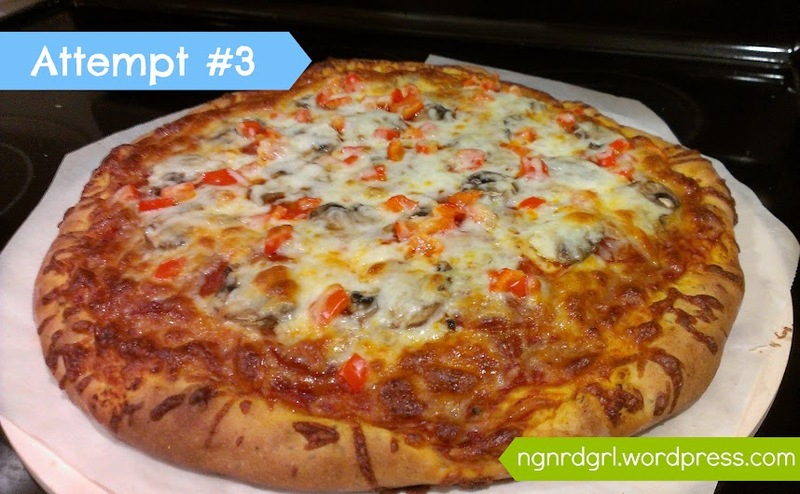 Here is the recipe for homemade pizza! You will need a bread machine, parchment paper and a pizza stone for the directions below. Put beer, oil, sugar, salt, flour, basil, garlic and yeast in a bread machine in the order recommended by the manufacturer. Select dough setting, and press Start. Preheat oven to 420 degrees F (215 degrees C) when dough is almost done. Remove dough from bread machine when cycle is complete. Roll or press dough on parchment paper covered in either flour or corn meal. Sprinkle dough with flour to reduce stickiness to make it easier to press or roll. Brush lightly with olive oil. Cover and let stand 15 minutes. While dough is sitting, place pizza stone in the preheated oven and preheat the pizza stone for 15 minutes. Place pizza dough with parchment paper in oven for 5 minutes. Remove pizza dough from oven and spread sauce and toppings on top of dough. Return to oven and bake until crust is lightly brown and crispy on the outside, about 15-20 minutes. To make a deep dish style pizza, use the full amount of dough for one 14" pizza. To make a thin crust pizza, cut the dough in half and make two 14" pizzas. One of the mistakes I made with my pizza stone is using it to reheat leftover pizza. The pizza stone makes such yummy pizza! So I thought it would be excellent for reheating left over pizza. And it is! However, do NOT reheat pizza without parchment paper! My pizza stone is a cheesy mess now and I am dreading cleanup. Because the pizza stone is porous, you do NOT want to use soap on it. It is OK to use warm water, but no soap. It's recommended to just use a damp towel to wipe it clean. Make sure to dry it thoroughly; you can do so in a warm oven. Alternatively, just don't ever clean it. The clumps will bake into the next pizza and eventually char away. This is the method I'm leaning towards. Possibly scraping off the larger clumps. Since clean up is hard, I recommend using parchment paper underneath leftover pizza. The parchment paper, in this case, will prevent cheese from adhering to your stone. A pizza peel is a giant, typically wooden, spatula used for putting pizzas in the oven and taking them out. I don't have a pizza peel, so I use a cookie sheet that does not have a lip. I use bottled yummy beer; usually Red Hook Pilsner or an IPA. I open the beer up in the morning an let it sit all day to make sure it is flat. Usually I set up my bread machine in the morning with all the ingredients in, then have the fiancé start it before I get home (my dough setting doesn't allow for a timer). You want to use Active Dry Yeast, NOT rapid rise yeast or bread machine yeast. If you have either of the following two, look up a conversion factor. You will need less yeast than the recipe calls for if you are using rapid rise or bread machine yeast. To make a frozen pizza, follow the directions above, but stop after putting on all the toppings. 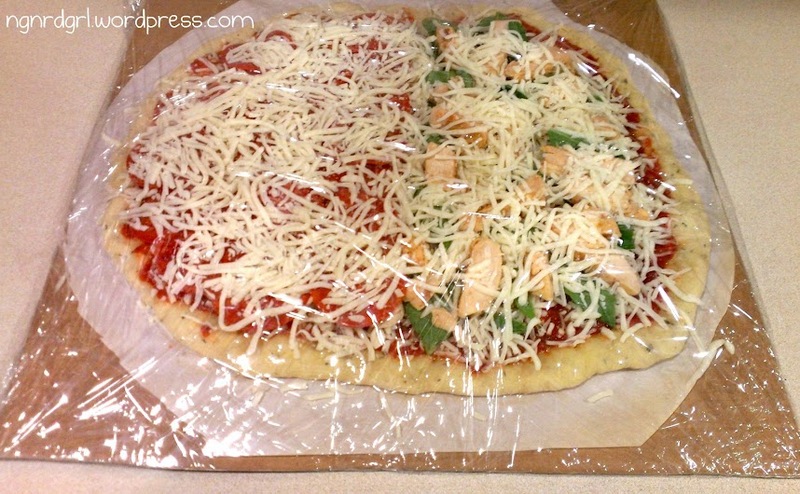 Wrap the pizza and parchment with Saran wrap. I cut to size cardboard and wrapped it in Saran wrap before putting the pizza (with parchment paper) on top of it. Put the whole shabangabang in the freezer. Ready to eat it? Preheat the oven to 420 degrees Fahrenheit. Preheat the pizza stone for 15 minutes. 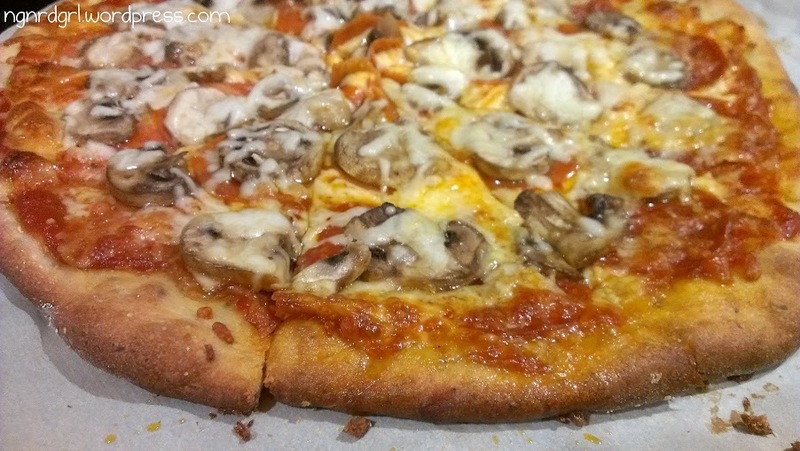 Take the pizza out of the oven and slide pizza and parchment onto the pizza stone. Do not put the cardboard into the oven. Cook for 15-20 minutes or until bubbly. I reuse the cardboard for my next frozen pizza. This recipe is based on Bread Machine Pizza Dough recipe from allrecipes.com. It has been modified based on suggestions from comments and from experience. Laroma Pizza Stone Set - This is the pizza stone I purchased from Macy's. It is $30 and comes with a pizza cutter that isn't too shabby. Breadman Pro Bread Machine - This is my bread machine that I got from my fiancé for Christmas a couple of years ago. I couldn't find the exact model on Amazon, but that is where he purchased it. We LOVE our bread machine! 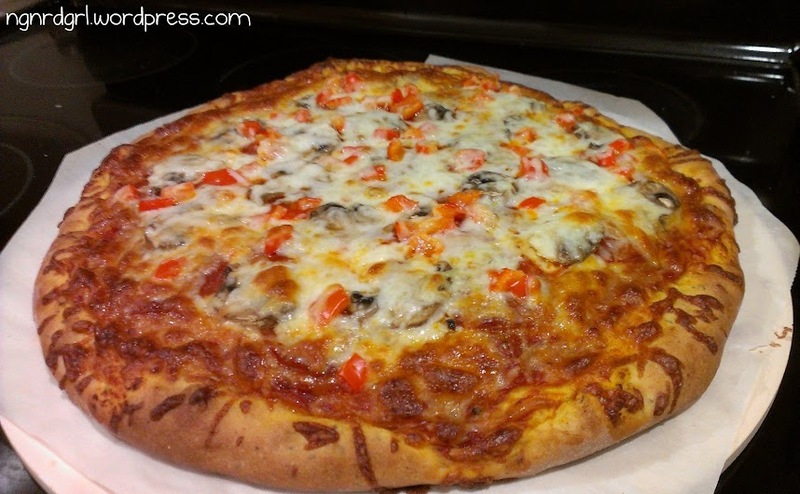 Basic Pizza Dough - By Hand Method Recipe - Here are some directions on how to make pizza dough without a bread machine. You can use this technique with my adjusted pizza recipe from allrecipe.com. How to clean a pizza stone? 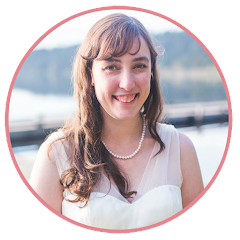 - a discussion of how different people clean their stones. How to Clean a Pizza Stone - this method uses the self cleaning cycle on your oven. I have not tired using this method. I have a pet parrot, so creating excess smoke is a concern to me. If you have, let us know in the comments below how it worked. 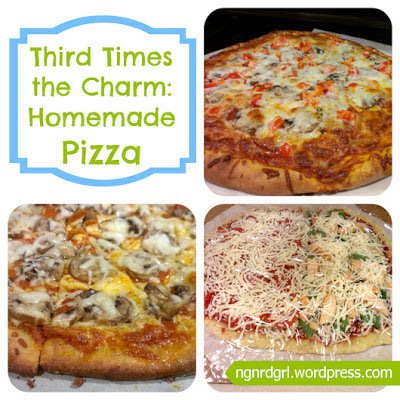 Do you make homemade pizza? Have any tips and tricks you would like to share? Tell us in the comments! My family loves home made pizzas as we all like our different toppings..I am definitely going to buy a pizza stone as I hear how much better the pizza is when cooked with one. My pizzas usually end up burnt on the crust, soggy in the middle (your example #1).. Thanks for the confirmation that a pizza stone is the way to go!! I'm so impressed with your commitment to persevere despite two attempts that didn't turn out as you planned. I never knew the merits of a pizza stone (we were given one as a wedding gift that I now regret throwing out). But you've inspired me to open my mind to the possibilities of homemade pizza. Allrecipes.com is a favorite resource of mine, as well, so thanks for sharing these nifty tips and tricks! I definitely learned a lot. Wow they all look so yummy! I love to make homemade pizza. I haven't made pizza since doing no carbs but soon! Thanks for the yummy recipe! Stop by if you have time Running Away? I'll Help You Pack! You know, I heard that you can buy a stone tile at a Home Depot type store for a lot cheaper and season it yourself for a lot cheaper if you didn't want to spend the money on a pizza stone. :) That looks good, I'm so happy we are having pizza tonight since you've given me a craving for it! I have read the same thing and thought about it when I was researching pizza stones. I am just not sure if those tiles would be treated with some type of chemical. I would want to research the tile very carefully to ensure that it is safe to eat off of. We are having homemade frozen pizza tonight! I can't wait! Haha! Your second attempt is identical to my first attempt! But instead of my pizza being stuck on the cookie sheet, my pizza-turned-into-calzzone stuck to the pizza peel. It had been sprinkled with corn meal, but I had failed to "season" it with flour. I found the pizza peel at a restaurant supply store and it was quite reasonable. The handle was really long so we sawed some off... I too had heard to use a tile from the home supply but like you, was afraid to risk something baked in or would seep out during the baking process. I use my pizza stone for making bread also, and it works beautifully. I think it has paid for itself many times over. DH even uses the stone when he makes a (ick) store bought frozen pizza. For leftover pizza that is not soggy like from the microwave, try reheating it in a non-stick skillet over the stove. Works great for me, and it is not unevenly heated with cheese all over the plate. Great post...next you need to learn how to make a Chicago deep dish! 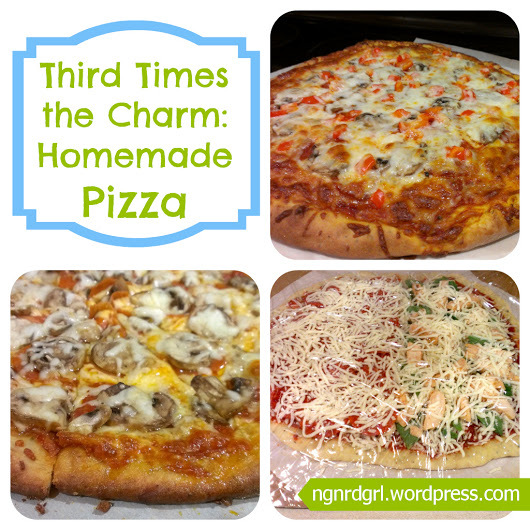 I am not a big pizza fan, but I do love homemade pizza! My mom made the best wheat crust!! Haha! Homemade pizza is the best. I think I might try a half flour half wheat crust next time. That sounds good! Yes, you make a great point about the chemicals. You'd have to be very careful.